An edited version of this article was published by Time (see their version here). On Sunday October 4, 2010, the small Hungarian village of Kolontar was evacuated. Local officials had been warned that the dam at the nearby Ajkai alumina plant was about to be breached. 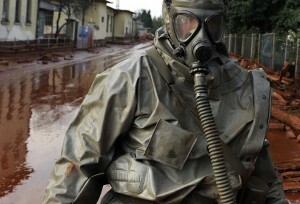 The following day over 700,000 cubic metres of caustic red mud burst out of the storage reservoir and a two metre toxic wave devastated Kolontar and two other villages, killed 8 people, hospitalized 150, contaminated over 1,000 hectares of farmland and polluted 3 river systems. An intense political drama about responsibility for the spill is being played out in Hungary, with furious statements by the Prime Minister (“This should have been detected”), the nationalization of the operating company (MAL) until compensation is paid and the temporary arrest of its CEO, Zoltan Bakonyi, a controversial figure whose father ran the Environmental Department at the Ministry of Industry around the time when the alumina plant was privatised. Although Communism ended in Central and Eastern Europe in 1989, its industrial legacy lives on. COMECON, the Soviet Union’s economic planning unit, encouraged the countries in the Danube River basin – Bulgaria, Hungary, Romania, and Yugoslavia – to develop dirty mining and metallurgy industries. Heavy industry also had special status in Communist lore; the London based historian George Schopflin describes how “miners and metal workers, regarded as the citadels of support to the party, were given higher wages”. Following the Hungarian spill there was a brief media frenzy in Romania about a red mud site at an alumina plant in Tulcea, near the Danube Delta, a UNESCO protected “World Heritage Site”, a vast wetland that contains over 800 bird species and unique types of fish. A few miles upriver from the delta, over six million tons of caustic red mud are stored behind an earth dam. Red mud is a relatively benign by-product of mining when compared to cyanide, which is used in large quantities to wash traces of gold out of the millions of tons of ore that is left behind by the gold mining process. (To get one gramme of gold a hundred tons of ore is processed and discarded). The most controversial project in the region is in the Romanian mining town of Rosia Montana. A Canadian investor plans to build a dam that will contain over 214 million tons of “tailings” (a toxic soup of cyanide, water and ore). The mining company’s own “Hazard Assessment” claims that the chance of a “dam break scenario” is “less than once in 100 million years”. But Romanians are sceptical and they still remember the dam breach of 2000 when 20,000 tons of contaminated sludge, cyanide and heavy metals burst out of the Aurul gold mine reservoir near Baia Mare, killing thousands of tons of fish in four river systems. The Australian investors had promised Romanian authorities that it was safe to deposit large quantities of cyanide in a plastic lined reservoir. But a combination of bad design and freak weather conditions burst the dam and raised a question mark over the wisdom of storing cyanide in this manner.